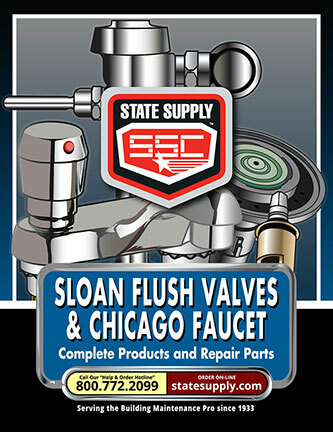 The Sloan Valve and Chicago Faucets maintenance and repair catalog includes an extensive compilation of products by Sloan Valve and Chicago Faucets, including repair parts and accompanying schematic drawings. It is a must-have for your shop or truck. SV-A Super-Vee model A, hand-held electric drain cleaner less carrying case. Includes: 1/4"x 25' and 3/8" x 25' cables, HESC five piece cutter set and one additional plastic cable cartridge. SV-A-WC Super-Vee model A, hand-held electric drain cleaner with carrying case. Includes: 1/4"x 25' and 3/8" x 25' cables, HESC five piece cutter set and one additional plastic cable cartridge. SV-B Super-Vee model B, hand-held electric drain cleaner less carrying case. Includes: 1/4"x 25' and 3/8" x 35' cables, HESC five piece cutter set and one additional plastic cable cartridge. SV-B-WC Super-Vee model B, hand-held electric drain cleaner with carrying case. Includes: 1/4"x 25' and 3/8" x 35' cables, HESC five piece cutter set and one additional plastic cable cartridge. SV-C Super-Vee model C, hand-held electric drain cleaner less carrying case. Includes: 1/4"x 50' and 3/8" x 35' cables, HESC five piece cutter set and one additional plastic cable cartridge. SV-C-WC Super-Vee model C, hand-held electric drain cleaner with carrying case. Includes: 1/4"x 50' and 3/8" x 35' cables, HESC five piece cutter set and one additional plastic cable cartridge. SV-D Super-Vee model D, hand-held electric drain cleaner less carrying case. Includes: 5/16"x 25'' cable. SV-D-WC Super-Vee model D, hand-held electric drain cleaner with carrying case. Includes: 5/16"x 25'' cable. General Wire Power-Vee model F hand-held electric drain cleaner with power cable feed and carrying case, which includes a 1/4" x 25'' cable. General Wire Mini-Rooter Pro model MRP-A features a folding handle, built-in dolly, removable drum, and 50' 3/8" Flexicore cable to clear 2", 3", and most 4" lines. General Wire Mini-Rooter Pro model MRP-A features a folding handle, built-in dolly, removable drum, and 75' 3/8" Flexicore cable to clear 2", 3", and most 4" lines. General Wire Mini-Rooter Pro model MRP-A features a folding handle, built-in dolly, removable drum, and 50' 1/2" Flexicore cable to clear 2", 3", and most 4" lines. General Wire Mini-Rooter Pro model MRP-A features a folding handle, built-in dolly, removable drum, and 75' 1/2" Flexicore cable to clear 2", 3", and most 4" lines. PH-DR-A Drain-Rooter model "A" floor model drain cleaner with power feed, 4 foot guide hose, water-proof air foot switch, leather gloves, variable speed motor with reversing switch and 5/16" x 50' cable. PH-DR-B Drain-Rooter model "B" floor model drain cleaner with power feed, 4 foot guide hose, water-proof air foot switch, leather gloves, variable speed motor with reversing switch and 5/16" x 50' cable. With 5-piece HESC cutter set. PH-DR-C Drain-Rooter model "C" floor model drain cleaner with power feed, 4 foot guide hose, water-proof air foot switch, leather gloves, variable speed motor with reversing switch and 3/8" x 35' cable. With 5-piece HESC cutter set. PH-DR-D Drain-Rooter model "D" floor model drain cleaner with power feed, 4 foot guide hose, water-proof air foot switch, leather gloves, variable speed motor with reversing switch and 1/4" x 50' cable.